Now here’s an idea so ingenious, we’re kicking ourselves for not thinking of it first – a biodegradable flower pot that you can plant right into the earth. If you’ve ever purchased a plant with the intention of replanting it into your outdoor garden right away, you might have noticed how wasteful it is for it to come in its own plastic container (which you might end up having to throw away). SoilWrap is a product that does away with that frustration because it acts as a protective cover while the plant is being shipped and informational packaging while the plant is on a store shelf, but once it’s completed those two tasks, it can be planted right into the ground. Developed by Costa Farms and Ball Horticulture, the thin packaging is made of mirel, a bio-based material that can break down in your soil or be composted. According to Costa, US horticultural plastic use exceeds 350,000,000 lbs per year and currently only about 4% of the plastic generated is recycled. SoilWrap is a smart alternative to all of that non-biodegradable plastic that is lighter than its more traditional counterparts and has many other advantages as well. Aside from being totally plantable (it decomposes in the soil within one growing season), it’s made from mirel, a 100% renewable material made from biopolymers produced by microbes, and uses no petroleum. 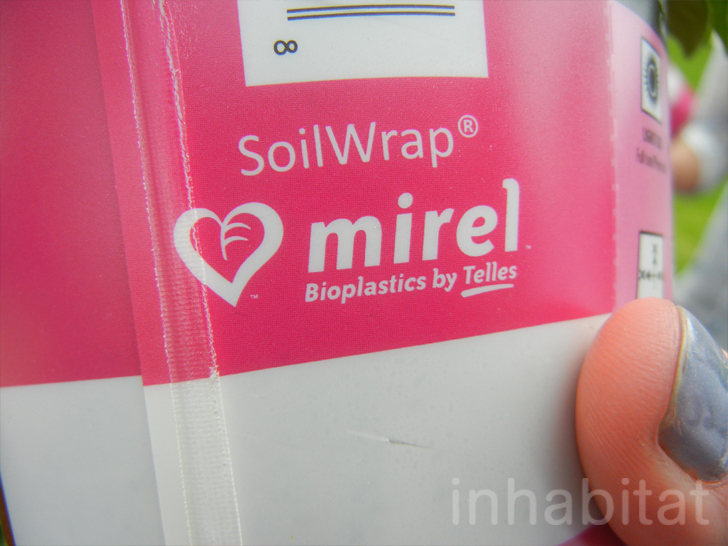 Since mirel can be printed on, all of the growing information can be presented to the customer right on the SoilWrap, further saving materials. There’s even a perforated strip you can tear off of the wrapper before you plant it, which becomes a plant tag. “SoilWrap offers environmentally friendly solutions to the home gardener,” explains Bill Doeckel, general manager of Ball Innovations. “The plantable, printable design addresses the massive landfill waste associated with horticultural plastic – and there are no pots to clean up after planting.” And we’re not the only ones raving about SoilWrap. The product has received the Greener Package Award in 2010. Bonnie has been doing this for years:http://bonnieplants.com/. They have biodegradable pots of recycled paper and a small shrink plastic ring at the lip with printed matter. \"A national plant wholesaler based in Alabama, Bonnie Plants supplies retail stores all over the United States. You may recognize us by our green hat logo and our biodegradable pots. If you’re a Bonnie gardener, you know us for our quality plants—the best vegetable, herb, and flower plants available. Bonnie Plants began in 1918 in the backyard of Bonnie and Livingston Paulk and has grown to include 70 greenhouse locations around the country. \"
Now here's an idea so ingenious, we're kicking ourselves for not thinking of it first - a biodegradable flower pot that you can plant right into the earth. 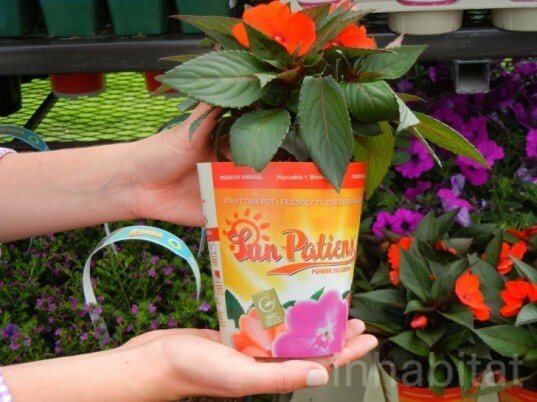 If you've ever purchased a plant with the intention of replanting it into your outdoor garden right away, you might have noticed how wasteful it is for it to come in its own plastic container (which you might end up having to throw away). SoilWrap is a product that does away with that frustration because it acts as a protective cover while the plant is being shipped and informational packaging while the plant is on a store shelf, but once it's completed those two tasks, it can be planted right into the ground. Developed by Costa Farms and Ball Horticulture, the thin packaging is made of mirel, a bio-based material that can break down in your soil or be composted.